Ford, in addition to being one of the world’s most recognizable automakers and burgeoning mobility companies, is also a lover of surveys. In fact, one might even say that commissioning surveys and studies that in some way or another support the greatness of its products is a great passion of Ford’s, one that provides the company with a sense of wellbeing and emotional fulfillment. And, hey, funny enough, that is exactly what Ford’s most recent study sought to measure. Things that thrill or excite, called “buzz moments,” included in the survey of several volunteers included cheering on a football match, watching an episode of Game of Thrones, sharing a passionate kiss, or taking a salsa dancing class. Weird, right? Well, the objective of the survey was to prove that all of these exciting moments fall short of the glory experienced when driving a sports car. According to Ford, participants sat behind the wheel of a Ford Focus RS, Focus ST, or Mustang and experienced 2.1 “buzz moments” on average over the course of a “typical commute.” This was shy of the 3 buzz moments experienced while riding on a roller coaster, but more than the 1.7 buzz moments experienced while shopping; 1.5 buzz moments experienced while watching Game of Thrones or football; and zero buzz moments experienced while dancing, eating fancy food, or kissing. So weeeeeeirrrrrrd. In this case, rather than just use the evidence to suggest that everyone go out and buy a Ford sports car (though it’s certainly implied), Ford used the information to build a Buzz Car. 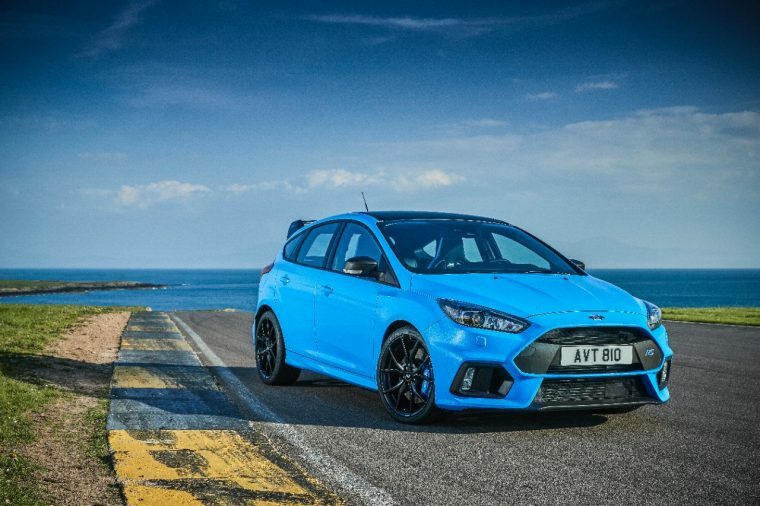 This Ford Focus RS, thanks to a partnership with Designworks and Sensum, determines when a buzz moment occurs by using “emotional AI” and displays driver responses via light strips and LEDs. It also has a high-performance gaming PC for reasons.